What do you think makes the OSSC such a challenge for a HDMI switch - its non-standard video modes? For sure. I have no expertise here. I think the standardization process of digitizing video landed on some very well defined formats that were trivial to adhere to when designing new devices. But our old analog devices are sending screwy dimensions and refresh rates that fall outside the standard bounds and most devices just aren't tested that much. Ever run into problems using OSSC with older (480i or 480p) consoles? I currently have it hooked up to my Dreamcast using FirebrandX's settings. I use Dreamcast and N64 no problem. The only issue is that I've never gotten 480i working in 3x scale. Even connected directly to my TV. So I have no data if functionality is lost there. I found a few more I'm considering pickup up. None support 4K60, but I just need OSSC support in all modes and audio breakout. A lot of those matrices you listed support Picture in Picture. That most certainly means a frame buffer and downscaler instegrated into the device. And at these price points I'm dubious that they're not cutting every corner they can. Including funneling all signals through the frame buffer. I've wasted enough on devices that had one job and didn't quite work. So I'm reluctant to think it's a good idea to get both functions in one device. But if you find one that works flawlessly, I'd love to hear it. A lot of people like matrix setups. Depends on the device. I have a little Prozor branded three input (3x1) with PIP and an audio breakout that has no additional lag. The Leo Bodnar result is the same for the primary signal even with the PIP enabled. It's not HDMI 2.0 or 4k compliant, though. I don't remember where I got it, though. Probably in a junk box from a lot. I wouldn't have consciously bought it. It doesn't have any options for PIP, though (besides on and off). It's just a couple stationary poorly scaled little preview windows to see what else is connected. Having just got a 4K HDR TV its kind of messed up my capturing abilities, with my old setup my AVR had 2 outputs one i sent to my TV and the other to my PCI Magewell capture card in my PC (also in this setup was a digital to Analog decoder to change the 5.1 audio from my AVR to stereo for my capture card) but as my AVR isnt HDR compatible ive have to connect my Xbox One X directly to the TV bypassing my AVR and thus my ability to capture anything from my XBox One X anymore. The OP listed the, 'ViewHD UHD 18G HDMI Audio Extractor / Splitter Support HDMI v2.0', would this allow me to run the hdmi from my Xbox One X to this ViewHD then one HDMI output to my TV and the other output to my capture card and also strip the 5.1 audio signal to 2 channel stereo, thus still sending 4K HDR to my TV??. Do this type of device introduce any sort of lag or any other side effects? That device on it's own is not going to allow you to send the video to your TV as well as your capture card. It's meant to send video to one device and audio to another. The audio line is always 1080p60 black in my testing. This is actually a property I want because it makes sure the AVR is less likely to reject the connection for an unsupported video mode. The recommended splitter would let you send one signal to the TV and one to your capture card. But you would be bypassing your AVR at that point. You can combine the splitter and extractor to send a total of 3 signals like I recommend. 1 to TV for best video. 1 audio-only to the receiver for best audio. And 1 duplicate of the complete A/V stream to your capture card. But I don't think it's going to downmix the audio there. You can tell the audio extractor to present itself as 2 channel stereo which should advise the XBox to stick to stereo. You might be able to integrate an audio injector to take your AVR's downmixed sound and put it in the capture card's stream. But I have no experience there. I have not done latency testing yet. I really should. I haven't noticed any added lag but that's not scientific. I just bought the successor model: the AVR-X3500H. How do you rate its compatibility? Not great I take it, otherwise you wouldn't have to bother with the whole audio extractor setup... I've been able to get both my OSSC and Framemeister working, although my Philips Blu-ray player goes pink when I set 4K Signal Format to "Enhanced"! It's actually pretty good. I got the extractor back when I had an older receiver with much crappier compatibility. The X3400H really only had serious problems with 240p 1X OSSC. Also I'm still paranoid it's adding lag. But I could be wrong. You're right, but I'm hoping there's only added lag on the PIP input (I won't use PIP anyway) and little to no lag on the main outputs. Of course lag will be the second thing I test! LOL, first is that it actually works! To be fair i dont mind by-passing my AVR as i can get audio form the TVs ARC, i guess i can use the digital to Analog decoder IF the splitter i use has a optical digital or coaxial output. Does a splitter allow for 4K HDR video on the main HDMI output and downscale to 1080p for the secondary hdmi output as my capture card wont support 4K? 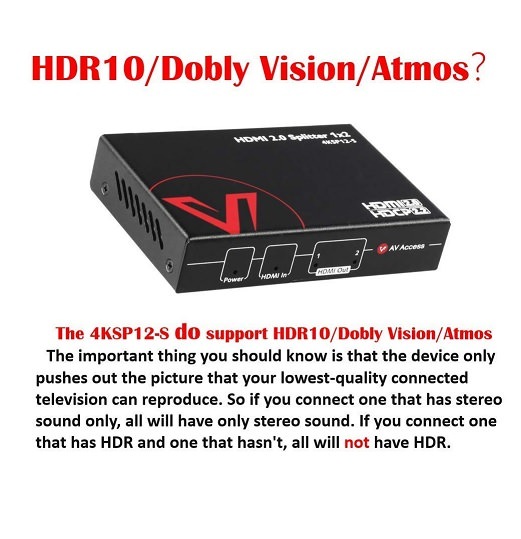 Does a splitter allow for 4K HDR video on the main HDMI output and downscale to 1080p for the secondary hdmi output as my capture card wont support 4K? I'm not immediately aware of one. There's no technical reason it *couldn't*. But I expect that functionality is in low demand. The more common behavior for a splitter is to advertise itself as only supporting modes available to all connected outputs. I believe the recommended splitter is so compatible because it explicitly doesn't do that. It just passively taps into the connection between input and output 1. And replicates that stream verbatim to output 2. I don't own one, but the HDFury Vertex was designed to do that. If I understand correctly, it can passthrough 4k@60Hz HDR on one port and downscale to 1080p@60Hz with or without HDR on the other port. There may or may not be a cheapo knockoff out there; I haven't looked. Ah ok so it wont 'downgrade' both outputs to 1080p then, as i defiantly dont want that to happen....i mean getting a 4K capture card isnt the end of the world. So what splitter should i be looking at? If I were in your shoes. I would get the one I'm recommending in the original post. Then set your XBox output to whatever the capture card can handle while capturing. Then back up to 4K HDR when not capturing. says it can send 4k on one output and 1080p on the other, only down side is it doesnt have a toslink connection so i cant hook up my digital to analog audio converter to it though....damn! Be sure to let us know how that turns out. I'm once again highly dubious that it will work with all the OSSC modes. But I'm unclear whether the OSSC is one of your targets. DirkSwizzler, have you ever used any EZCOO products? FYI they also have a couple of splitters (1x2 and 1x4) that supposedly can output 4K and 1080p simultaneously. I have not tried their products. The graveyard in the first post is the entirety of what I’ve tried. And now that I’ve found a trio of devices that cover the compatibility spectrum in the topic title. I’m going to stop throwing money in the HDMI fire for a while. I don’t quite understand the appeal of downsampling at the splitter instead of just using one source resolution that works for both sinks. It's because none of my capture devices will handle 4k@60fps HDR. For some random streaming I'm ok having it downscaled to 1080p if it means I don't have to mess with my PS4 settings all the time. I also bring that 1080p output into another matrix switch that has some 1080p monitor(s) on it that I sometime use to do quick things on the ps4 when I'm too lazy to go over to the TV. I use this 1x8 HDMI 1.4 splitter. It supports all OSSC outputs. It supports everything I have thrown at it. It just works. Not 4k. I don't use HDR on anything. It sits directly after the OSSC output in my chain. Getting good OSSC coverage is a nice trait all by itself. Does it work for the test pattern? All multiplications of a NES without dropping frames? I had some success with an HDMI 1.4 splitter. But it would drop frames in 5x on 1 of the 2 sinks quite a bit. I picked it up on recommendation. I've been very happy with it. I went ahead and ran some tests for you. I turned on all the displays and video gear connected to it, so that's eight simultaneous connections. I can't see any signs of frame drops on the NES or SNES with the Green Hill Zone scroll test or the Grid Scroll Test. I also did the DVDO Judder Test, unlocked the frame rate, and changed the refresh rate. No sign of issues. I been playing quite a bit of Neo Geo recently and that passes the eye test, but I can't be scientific with that one. My displays all handle 960p, so I am able to test all modes. I also sent the OSSC 240p passthrough down the chain, through a DAC, to the FC-14, and to a consumer CRT. No issues. One of my televisions hates the sync jitter from the NES and SNES, but that's not the splitter's fault. That display loses sync sometimes while all the others (also connected downstream from the splitter) remain synced up. BUT NO AUDIO THROUGH EITHER HDMI PORT!!!! WTF!?!?!? Basically, it's the exact same as the ViewHD, but cheaper. Anyone have any ideas why there's no audio through the HDMI ports? I tried cycling through the three audio choices. Maybe I'm just making a silly mistake? Do you have an EDID viewer / editor you can drop in the chain? Do you have ARC enabled on the switcher? I'm probably wrong about this, but the 4th image on that listing shows that, when you have ARC mode on, it sends audio to the TOSLINK port. That might only be for audio received from the TV via ARC, but it wouldn't surprise me if that also meant audio from the HDMI inputs is also entirely routed out the TOSLINK port. I don't, but I think I might be able to use my Epiphan DVI2USB as an EDID viewer. I'm probably getting that backwards though. I tried every combo of audio setting with ARC on and off. I didn't try removing the TOSLINK cable though. Honestly, for $50, it still is a great choice for now...but I'd really like to have audio routed through BOTH the TOSLINK and HDMI ports. Basically, it's the exact same as the ViewHD, but cheaper. Can you be more specific on which ViewHD you're comparing it to? EDIT: Oh, I see that one of the "generic ones on amazon" was a ViewHD 6x2 4K@30Hz . So I assume that one? Ok so I bought the splitter and extractor you recommended for my streaming setup. The splitter barely works at all. The image will show up on my Plasma TV but there is some screen garbage. There is no image no matter what Line mode I try on the VGA Monitor. Running straight from the OSSC to Tendak to VGA Monitor works just fine from Line 2x to Line 4x.